“Aegean Bronze Age Textile Production Techniques – Spinning and Weaving.” This experimental Archaeology workshop, organized by the Department of Aegean Archaeology, Institute of Archaeology, University of Warsaw and the Biskupin Archaeological Museum, will take place in Warsaw. -Anna Grossman, MA – a head of the Research Department of the Biskupin Archaeological Museum, archaeologist and experienced technician in experimental spinning and weaving. She has been performed textile workshops in the Biskupin Archaeological Museum since 1980-ties, in order to popularize North European textile production techniques. In the tests conducted since 2011, mostly of exploratory character, experimental archaeology is applied as a teaching tool. For the use of participants there are several spindles with spindle whorls (copies of the BA Aegean artifacts), several band looms, two warp-weighted looms of Scandinavian type, as well as several sets of loom weights, which are the copies of Aegean Bronze Age artifacts reconstructed by students. 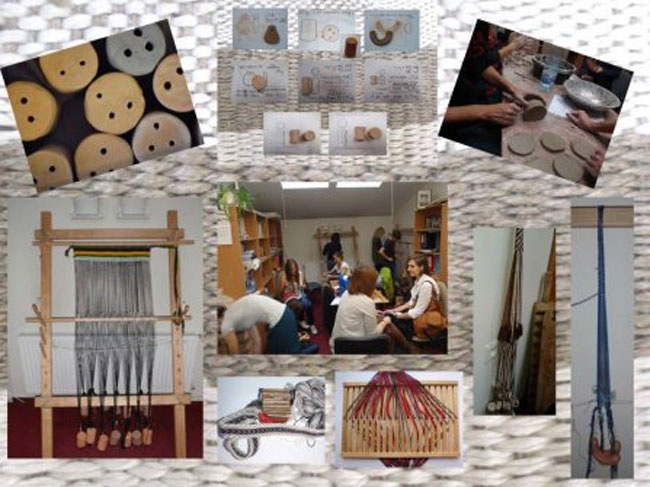 The main aim of the workshop “AEGEAN BRONZE AGE TEXTILE PRODUCTION TECHNIQUES – SPINNING AND WEAVING” is to teach and practice the basic “body knowledge” of spinning and weaving. During 3 days the participants will be practically introduced into spinning and weaving techniques. The last, 4th day is devoted to visit a unique Centralne Muzeum Włókiennictwa (the Central Museum of Textile Production) in Łódź [http://www.muzeumwlokiennictwa.pl/]. Introduction: Fibers used in the Aegean Bronze Age. Spindle-spinning technique. Parameters and functionality of spindle-whorls. Introduction: Mechanics of weaving. Band looms and starting borders. The possible knowledge of the loom with a rigid heddle in the Aegean BA. Documentation of band weaving process. Activities: Setting up and weaving bands and starting borders on a loom with a rigid heddle. Finishing. Introduction: Setting up the warp-weighted loom. Parameters and functionality of loom weights. Documentation of weaving process, documentation of woven textiles.